- on Tuesday March 12th, the Agora stage hosts the Aerospace Composites Circle with an exclusive keynote presentation of Dirk Gebser from Lilium on “Call to action for a new world” followed by the Hexion conference welcoming speakers from Composyst, Hexion Research and Hübers, on 2 components Technology for Advanced Composite Epoxy Systems. 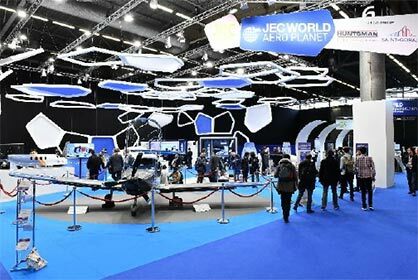 In terms of innovation, aerospace professionals will be able to discover more than 40 innovative parts within the Aero&Space planet, reducing costs and raising production rates, with workshops sponsored by Huntsman and Saint Gobain and with Toray, Porcher Industries…. As well as attend the pitches of the 10 Startup Booster finalists selected by Airbus, on March 12th at 11am at the Agora. Without mentioning the Innovation awards finalists, among which in the Aerospace Application category, Compo Tech Plus SPOL for its Composite aileron structure cured in one step, Deutsches Zentrum für Luft for primary structure for sounding rockets; in the Aerospace Process category, Applus+ Laboratories, for its automated manufacturing process; or Cecence for its fully compliant 16G Composite aero seatback… Winners will be named on Wednesday at 4pm in the Agora stage, starting with the keynote speech of Bertrand Piccard, initiator and Chairman of Solar Impulse Foundation.